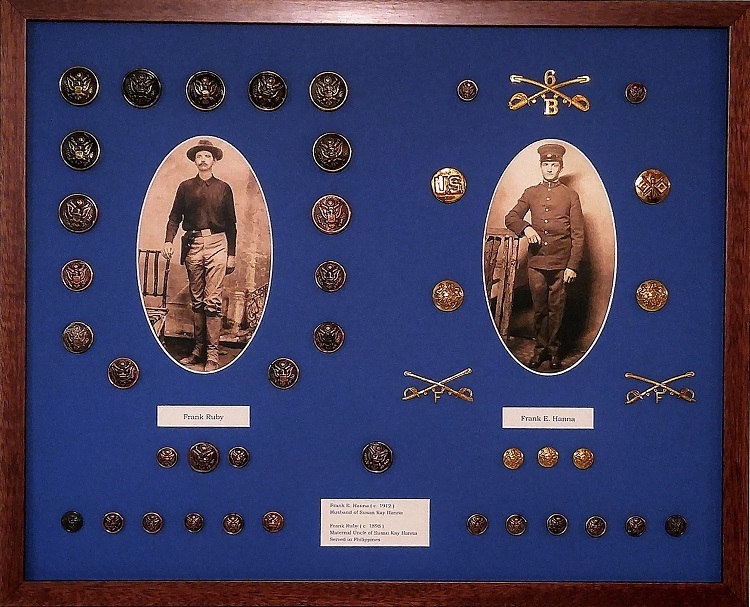 Picture Framing for Military Keepsakes - Carmichael Inc.
We feel honored when someone chooses Carmichael to do their custom picture framing for military keepsakes. A customer wanted to update the presentation for these items that had been originally framed by a family member. The items were not protected behind glass, and the frame was not in good condition. Here’s what the piece looked like before we got started. 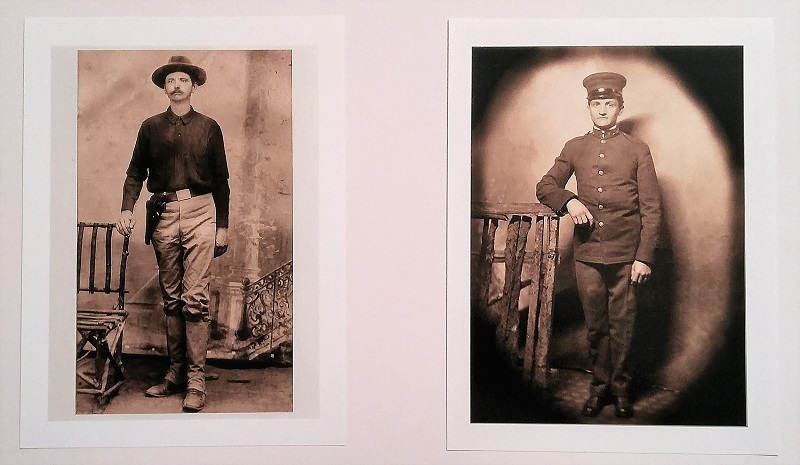 The first thing we needed to do was get some larger prints of the two soldiers made, so that the original 2″ x 3″ photographs could be safely stored away. They were getting worn due to being out in the open so long. Good digital images that could be printed out in high resolution at 5″ x 7″ were provided by Tony Nicholas. The most challenging part of this project was figuring out how to arrange everything. 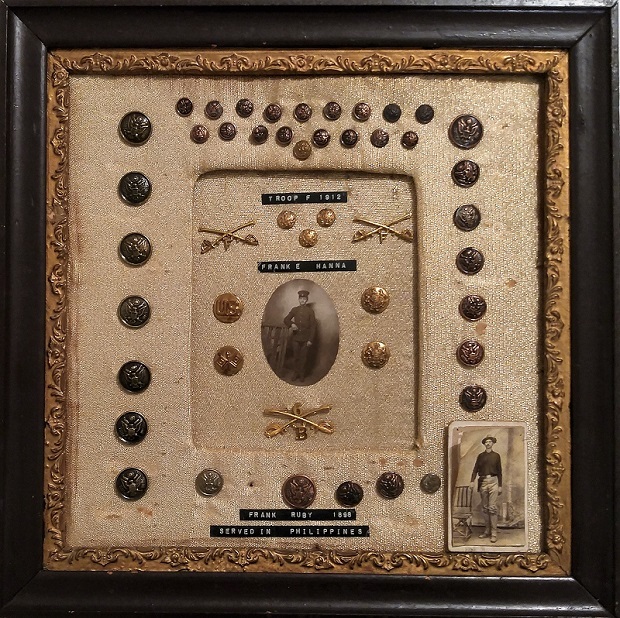 Lots of buttons and pins to position around the photos. I did the layout using CAD. Oval cutouts for the photos worked out nice. 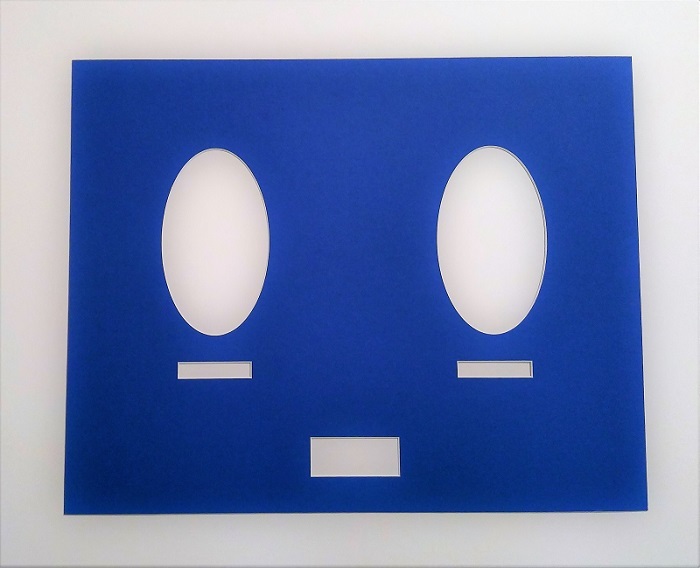 We chose blue for the mat, which provides a nice contrast to the gold colored keepsakes. Here’s the mat before everything was attached. I used a CAD drawing generated from my layout work to make sure all of the holes for mounting the buttons and pins were exactly on location. This way I didn’t have to take a chance on making any marking mistakes. A drill was used to make all the small mounting holes. I made the text boxes on inkjet photo paper. A classic walnut frame was chosen, as it dignified this custom picture framing for military keepsakes quite nicely. After getting everything attached to the mat, spacers were used to keep it all from touching the glass when assembled. Here’s what the finished piece looks like.